While opening up a packet of incense, we came across this interesting picture of a Sperm Whale blowing chunks. As the object got closer, Clyne, founder of Paradigm Video Productions of Key West, realized it was the largest jellyfish he'd ever seen and a species he didn't recognize - so he put on a mask, snorkel and fins and jumped into the water with his video camera. The reason Clyne didn’t recognize the jellyfish is that it doesn’t belong in the Gulf — it’s an exotic species, native to the Pacific and Atlantic oceans, Adriatic and Mediterranean seas, and has been recorded off Argentina, Brazil and Colombia.Scientifically known as Drymonema dalmatinum, the jellyfish is commonly called big pink jelly or pink meanie. Big pink jellies have been reported in the northern Gulf, but Hector Cruz-Lopez of the Florida Fish and Wildlife Conservation Commission had never heard of the species off Southwest Florida.“It’s suspected to travel in the ballast of merchant ships,” Cruz-Lopez said. “They’re apparently doing well.”Drymonema can also travel to unfamiliar water on currents. 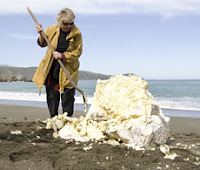 The mystery object washed up on Wellington's south coast may not be cheese but valuable ambergris, the fancy term for whale vomit. Wellington City Council spokesman Richard MacLean said it had been inundated with calls from people convinced that the large, grey, greasy block found at Breaker Bay is the much sought after and valuable ambergris which is most commonly used in the manufacture of perfume. Ambergris is an excretion whales produce in response to irritation caused by squid, which forms a large part of their diet. It washes up on beaches and is considered valuable because of its rarity and the uncertainty of supply. Mr MacLean said the council was not convinced about the theory but had not yet ruled it out. The object was at first considered to be a huge piece of cheese. "So many people have rung in saying `it's worth half a million dollars', we feel honour-bound to actually go out and stake our claim on it." He believed it was far more likely that the block was tallow or some sort of packing material from a ship. The grey lump, roughly the size of a 44-gallon drum and weighing anything up to 500kg would be a "real pain" to shift, Mr MacLean said. World Cup Final- Exteberria Wins. The Men’s Final is now upon us, Edu Exteberria, (EUK) the experienced coach of the Basque team and mentor to many kids that he teaches, and David Speller (JER) the kid from Jersey who is flowing with incredible natural talent and a force that is now present in the men’s division. The competitors requested additional time for their heat to ensure that the best waves are selected, the judges are set and the timers are ready as the final heat of the competition is under way. Right off the bat Speller nails a beautiful long wave that showcases his talent by landing every move executed and receives the top initial score. Edu fires back several times with his signature tail slash and spray, as time winds down there are no waves to be found like David’s first wave. Then in the final 2 minutes, with good position and priority Edu gets a quality wave that has great potential to shape up, he lines up and in perfect position as he performs a near perfect sequence the earns him the championship. Edu Exteberria is the 2008 World Cup Champion. As gas prices in North America fall in line with the rest of the world, here are a few tips from those who are paying $4 a litre. First rule of eco-driving - ditch unnecessary weight. Remove top boxes and boats from racks. Remove racks if possible. Do not brim the fuel tank as this also adds extra weight. Make sure the tyres are inflated to the correct pressure. Under-inflated tyres are not just dangerous - they create more resistance to the road and so make the car less efficient. The central tenet of eco-driving is to get into the higher gears sooner and not to rev the engine too hard. An eco-driver has to read the road - if you can plan ahead, you won't be accelerating and braking so much, thereby saving fuel and CO2 emissions. Do not use the gears to slow down. The idea is to lift off the gas in a higher gear, and allow the car to lose momentum. If you're a good eco-driver, you'll then select the right gear to smoothly move on, without coming to a halt and having to bury your right foot in the carpet to get going. A car's most efficient speeds are between 45-50mph. The engine will be cold and at its most fuel inefficient when you start it. 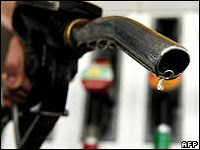 If you can drive away without having to reverse when the engine is cold, you will save fuel and have better visibility. "You in the Red Kayak. You are in Danger." This new system includes both old-style tone warnings, as well as recorded messages that spell out in detail the nature of the warning being given. When needed, live announcements can also be made with the system. The system installation will be completed the week of September 15th, and each of the eight messages will be tested before the installation can be signed off. After acceptance, the warning system will be tested at noon on the first Wednesday of each month, just like the old system. Mayor Jason Buelterman notes, “Tybee is such an outdoor recreation destination, many of our visitors and residents may be out on the beaches or over kayaking in the marshes,” adds City Manager Diane Schleicher. The Lazaretto Creek loudspeakers will reach across much of the back river marshes and most of the national park at Fort Pulaski. Because of these large numbers of people outdoors, particularly during the summer season, the City Council wanted to do something to ensure the safety of everyone on the Island in inclement weather. Even at $123,000 for the system and $36,000 for installation, it seemed like a wise investment on behalf of the citizens and visitors on the Island! Wildlife officials, responding to initial reports of dead manatees, found two carcasses in the Savannah downtown riverfront area Friday. A third carcass was recovered about a mile downstream later that day. The fourth was discovered on a piling of the Talmadge Bridge on Monday. As they try to piece together the likely accidental tragedy, wildlife biologists from the Georgia Department of Natural Resources are calling on anyone who might have seen a group of manatees in the river last week to report the sighting. Necropsies, or animal autopsies, of the first three carcasses revealed gashes likely made by the propeller of a ship larger than 65 feet long. One animal had been sliced in half, with only its top half recovered. "I've done dolphins' necropsies before and I've seen broken bones and gashes, but I've not seen that amount of trauma," said Tara Cox, assistant professor of marine sciences at Savannah State University, who assisted in the necropsies. "You can only imagine it had to be a fairly large prop." Clay George, a wildlife biologist with the Georgia Department of Natural Resources, led the animal examinations. "It was something like a tug or a large military vessel or a container ship or a tanker," he said. "We're almost certain it was not a small recreational boat." The unusually high number of animals involved led George to speculate the manatees were part of a breeding herd - a female in heat being pursued by up to a dozen or more males. "They were presumably cavorting in the middle of the channel, not paying attention, and they were hit by some vessel," he said. One of the manatees had mud in its trachea, which may indicate the animals were resting on the river bottom when a ship swept over the top of them. While they are air-breathing mammals, manatees can remain underwater for up to 30 minutes. Manatees, which weigh up to 2,000 pounds and can be more than 10 feet long, migrate north from Florida in April and remain in Georgia rivers and near shore areas through October. There are no scientific estimates of their numbers in Georgia coastal waters, but they are common in the Savannah River, George said. Rare loggerhead sea turtles are having a record nesting season on the Georgia coast and have been laying eggs in promising numbers on southern Atlantic beaches from Florida to the Carolinas. Still, biologists warn the population of mammoth turtles, which weigh up to 300 pounds, remains fragile. And the federal government is considering a proposal to classify loggerheads as endangered after 30 years of listing them as a threatened species. Along the 100-mile Georgia coast, biologists and volunteers working with the state Department of Natural Resources have counted 1,640 nests since the nesting season began May 1. That's the most turtle nests recorded since Georgia began keeping count in 1989, breaking the previous record of 1,504 nests in 2003. That's still short of the state goal of 2,000 nests per year for 25 years. Researchers use nest counts as a barometer for the overall loggerhead population, as the turtles spend most of the year at sea. About 90 percent of loggerhead nests in the U.S. are found in Florida, which had its worst nesting season since 1989 last year. Florida biologists counted 28,074 nests in 2007, less than half the state's peak of 59,918 in 1998. Beth Brost, who compiles sea turtle nesting data for the Florida Fish and Wildlife Research Institute, said no numbers have been tallied so far this year. She said nesting appears to have increased on the 28 beaches Florida uses to compare year-to-year progress. "It's not up substantially, but it is up, which is always a good thing," Brost said. "Overall, the trend has been in decline." In South Carolina, sea turtle program coordinator DuBose Griffin said she expects 4,000 to 4,500 loggerhead nests by the end of the August, which would be one of the state's best nesting years since 1980. North Carolina sea turtle biologist Matthew Godfrey said nesting there has been above average, with nearly 800 nests counted so far. Researchers say the nesting increase could be the result of the turtle's natural reproductive cycle. Female loggerheads typically lay eggs once every two or three years -- causing nesting trends to fluctuate year to year. Mark Dodd said a sharp decline in shrimp boats trawling off the Georgia coast, because of high fuel costs and low market prices, this year may have contributed to Georgia seeing so many nests. Boat collisions and fishing net entanglements are the top killers of loggerheads. Overall, the loggerhead sea turtle population remains so low that the U.S. Fish and Wildlife Service and the National Marine Fisheries Service could declare loggerheads an endangered species in the U.S. next year. The species has been listed as threatened, a less-critical classification, since 1978. Sandy MacPherson, national sea turtle coordinator for the Fish and Wildlife Service, said a team of biologists must first determine if loggerheads nesting in the U.S. are genetically distinct enough to be considered separately from the worldwide population. If so, she said, the agencies could list them as endangered in early 2009. HILLARY CLINTON: When I was First Lady, I personally helped that little chicken to cross the road. This experience makes me uniquely qualified to ensure that right from Day One that every chicken in this country gets the chance it deserves to cross the road. But then, this really isn’t about me. DR. PHIL: The problem we have here is that this chicken won’t realize that he must first deal with the problem on this side of the road before it goes after the problem on the other side of the road. What we need to do is help him realize how stupid he’s acting by not taking on his current problems before adding new problems. JERRY FALWELL: Because the chicken was gay! Can’t you people see the plain truth? That’s why they call it “the other side.” Yes, my friends, that chicken is gay. And if you eat that chicken, you will become gay, too. I say we boycott all chickens until we sort out this abomination that the liberal media whitewashes with seemingly harmless phrases like “the other side.” That chicken should not be crossing the road. It’s as plain and as simple as that. This coming Satuday, September 13th, launching from Butterbean Beach. There will be a paddle up the Skidaway River to the Marine Extesion center. 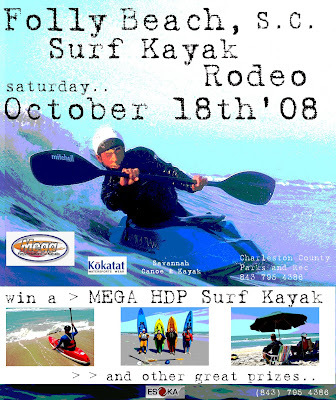 Classes, entertainment, food and drink will then be up for grabs, as well as a kayak give away, at this Diabetes Association event. 'The brunt of the storm skirted Savannah, but its outer bands brought blustery winds and ominous gray clouds to the Georgia coast. They also spawned 5 foot waves, drawing an adventurous few to the ordinarily tame Georgia beaches. "The waves are getting dramatically bigger," said Chuck Conn, a burly 49-year-old preparing to hit the waves at Tybee as his wide smile broadened. Signs posted around the beach warned of rip tides, and lifeguards were out in force monitoring the handful of surfers. But even town elders understood the call of the ocean. "Hopefully, the only impact we'll get from this is high surf and wind current," said Tybee Mayor Jason Buelterman, an avid surfer who chuckled when asked if he would hit the waves. "We're trying to encourage people to stay out of the water, so that wouldn't be a good example." Hanna was expected to make landfall on the South Carolina coast around 2 a.m. Saturday before marching quickly up the Atlantic seaboard and pushing into New England by early Sunday. Tropical storm watches or warnings ran from Georgia to areas just south of New York City. On Folly Beach, just southwest of Charleston, S.C., the tops of 8-foot waves were already being roiled into spray by Hanna's advance winds Friday afternoon as about three dozen surfers tried their luck. "This is the best time for us down here," said Matt Hamrick, a Charleston lawyer who has been surfing for 25 of his 38 years. He planned to hit the beach again at sunrise Saturday, hoping to ride curling waves pushed up by Hanna's winds after it comes ashore. Meanwhile, at Atlantic Beach, N.C., Danny Keylor, 23, said he surfed four hours Friday morning. "It's real steep, about 6 or 7 feet. It's real powerful, really strong rip currents," said the landscaper from Morehead City. "We've had some pretty good days this week, but this is the best session I've been in so far." "It's really good now," he said about noon. 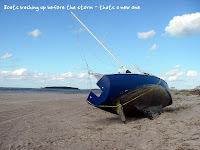 "It was choppy this morning." Caithness said he was leaving the beach "only because I have to be at work." So as Hanna veers more north than east we dodge another bullet. We do feel bad for the Carolina's, but that's what happens when you stick out. All our kayaks and gear have been stowed under and in the house in preparation for what could of been. We did have some great surf today and local paddlers were out ripping it up. The wind was calm and the waves were stacking up quite nicely about chest high. The next two days look wet and windy then giving way to a lovely mellow Sunday. Then, like a bull on fire, here comes Ike, stronger and meaner and following a very similar path to Hanna . We had a surf trip to Florida planned next week, but a possible Category three would be a 'run for the hills with all the boats and gear' scenario. Stay tuned. Hanna is struggling with some extremely high wind shear of 30 knots, thanks to strong upper-level winds from the north. It's amazing that the storm has held together in the face of this shear, but Hanna is definitely suffering. Satellite loops show the shear has destroyed all of Hanna's heavy thunderstorm activity except on the south side. These heavy thunderstorms are currently pummeling Haiti. The track forecast for Hanna. The current steering flow driving Hanna to the west-southwest is very weak, and we can expect erratic motion over the next day. By Wednesday, a rather strong high pressure ridge will build over Hanna, forcing it northwest to a landfall in the Southeast U.S. Due to the storm's expected rather random motion over the next day, plus the expected track of Hanna parallel to the Southeast U.S. coast, the location of final landfall has a much higher uncertainty than usual. The intensity forecast for Hanna. The wind shear of 30 knots is forecast to gradually relax to 10-15 knots by tomorrow morning, and remain in the 10-20 knot range until landfall Friday. This reduced shear should allow Hanna to intensify, as the storm will be over warm 29°C waters with a Tropical Cyclone Heat Potential (TCHP) of 50-70, just below the value of 80 typically associated with rapid intensification. The GFDL and HWRF models respond by intensifying Hanna to a Category 2 hurricane by landfall; the SHIPS model foresees a Category 1 hurricane. However, these models did not anticipate Hanna's current disorganization. Given the current disorganized state of Hanna, Category 1 strength is probably the maximum the storm has time to achieve before landfall. By Jeff Masters at the weather lab.